Her words struck my heart. I can’t imagine *not* being outside….even if it’s just to sit under a tree. I can’t imagine *not* engaging in nature every single day of my life. I can’t imagine *not* feeling a breeze for ten years. It’s a different world now. Yesterday, I had a lovely teenage mom help with the gardens. Paula brought along her two year old son and her little brother, and was working on a community service project. I am so happy she chose to come help out the gardens at The Agape Haus Studio. I absolutely LOVE showing kids the wonders of gardening (and ofcourse, heirloom bulbs). It’s always interesting to me that our culture, in our “progress” has moved so far from the garden. Literally, kids just don’t go outside anymore. Why should they? Our culture shows them exactly what to value….tv, video games and the ever-present cell phone, with the world at your fingertips. Kids are on some type of electronics, being plugged in, almostg the entire time they are awake. Think about that for a moment……It is an unsettling statistic. Why touch the dirt when you can Google and just some read quick facts about the soil? Why plant a flower when you can look at pictures on Instagram? Why engage in work, tilling a garden, when you can sit and play games on your phone? Why sweat and get dirty when you could be taking a hip selfie? It’s a generation of lost kids…..kids who have grown up without sitting outside under a tree, and feeling the breeze. In our brilliant attempt to create super-intelligent human children, we have over-scheduled and over-provided. We have over-monitered and over-induldged….all the while, we have under-appreciated the value of just being still. Her words were so poignant yesterday. 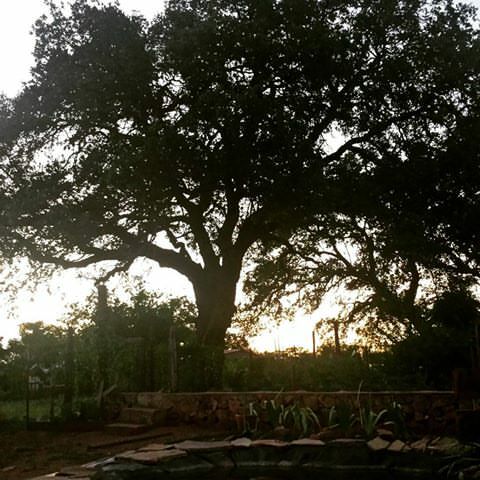 Paula just sat under the huge 300 year old Live Oak tree, with her hands covered in soil, and enjoyed the moment. She spent the afternoon planting over 200 Oxblood Lilies like a champ. Paula reminded me of an old farmer, sitting back in the old yellow chair, talking about the garden. Her beautiful smile never ceased. “You know, Noah always cries when he falls at home, but he is falling all over the place here (in the dirt) and he hasn’t cried once.” Kids just need time in nature. It calls to them. It gives them a new sense of time. Time to be free of limits and schedules. Time to daydream and think. Early garden ponderings beginning from birth….. I will never forget those words. I also need to remind myself to just stop. Feel the breeze on my face. Be still. It’s never to late to feel the breeze for the first time. To start over and reconnect with nature. To sit in the shade of an old oak tree, to touch the soil, smell a flower, watch a butterfly, or fall on the ground and get back up.